Yesterday in Wooler’s countryside classroom, duck plucking, butchering a pig, manuring marigolds, auctioneering sheep, building a stone wall, casting a fly, shearing a sheep and planting potatoes were some of the activities in which over 1500 children took part. This was at the Glendale Agricultural Society’s 2010 Children’s Countryside Day. Often this is the first time and perhaps for some the only time, that the children have even been to a green space, or close up to a cow. 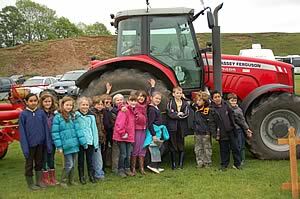 This year there was a special focus on “The Changing Landscape” and the 1550 children from 39 schools across Northumberland and Tyneside learnt from farmers and rural practitioners about farming, the countryside, rural life - how their landscapes are changing, how these changes happen and what the consequences might be. The emphasis was very much on creating awareness in a hands on, thought provoking way. From creating their own climate change battling superhero to building their own drystone walls, pupils from Northumberland and Tyneside learnt how climate change could directly affect both them and their families and what they can do to adapt. They met some of the farmers who have been affected and some of the organisations that are there to support them. The Show Field became a key teaching aid as the land used has already seen a huge amount of erosion due to the high river levels in the Wooler water. The Environment Agency one of this year’s main supporters, replicated the power of water to change landscapes on a smaller scale. Trays with sand and water flowing through it modelled the natural processes that happen in a river. To give an overall picture of how climate change affects different parts of the landscape another sponsor The Northumberland National Park Authority helped children piece together the Cheviot Futures jigsaw. The day featured, quite literally everything that you would expect to see in the country. Children saw beneath the surface – and witnessed the variety of rural activity that makes up the visible rural landscape and economy. North Doddington Farm, run by the Maxwell family, is one of the few remaining Dairy farms in the North East, and its grazing black and white cows are a trademark for some of rural Britain. Throughout the day the children learnt to connect with the cow. They saw real milk, and then how the milk is made into ice cream. Also on hand were the background skills and activities, the Beekeeping and Stick Dressing, the equine industry and field sports. When one thinks of a good day out in the country – they certainly do not come better than this.